Cathe Holden recently teamed up with World Label (again) to create some fun printable freebies. She made four different sets of patterned DIY paper tape— sheets you can print on label paper and cut into strips, then use them adorn packages, envelopes, business cards, invitations, jars, or other things that need spicing up. There are matching round stickers, too. I love the colored measuring tapes! Get them all here. That measuring tape is excellent! Is it accurate? Very cool! Hmm... I can see Courtney liking them even if they weren't printed on label paper. ;) Thanks! Not sure; haven't printed it out yet! YES! The measuring tape is accurate. 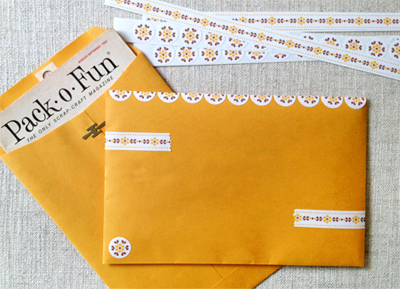 Jessica, thanks SO much for featuring my printables! And to find out that you did on Twitter from Felt and Wire...well, my day is complete! PS. 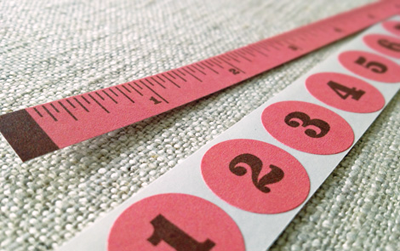 The accuracy of the tape measure may change if your printer shrinks images to fit. Check your settings. great stuff! thanks for sharing. Super Cute, Love them. Thanks for sharing. Thanks for replying, Cathe! Very cool that the tape is accurate! very nice, thank you Jessica and Cathe!